This B&H Kit includes the GoPro HERO3: Black Edition Camera and the DJI Phantom Quadcopter with GoPro Mount. 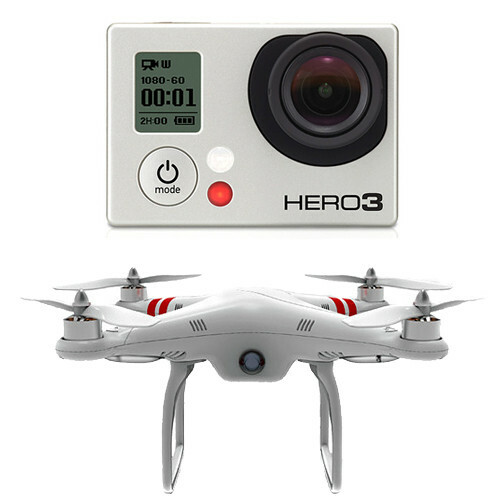 The contents of the kit will allow you to capture high-quality aerial shots with your GoPro HERO3. The HERO3: Black Edition is a Wi-Fi enabled action camera that supports up to 4K Cinema resolution. It also supports 2.7K, Full HD 1080p recording and more. You can use it to capture up to 12 MP still images as well. Plus, the HERO3 includes the Wi-Fi remote and a waterproof case that is submergible to a depth of 197' (60m). The DJI Phantom is a remote controlled, four-propeller quadcopter with a removable GoPro camera mount for capturing POV footage of flight with your HERO3. The compact and lightweight Phantom is ready-to-fly right out of the box and it includes a remote control unit and receiver, which gives the device a transmission range of up to 984.25' (300m). The Phantom also features an intelligent Naza-M + GPS multi-rotor autopilot system, Intelligent Orientation Control (IOC), high-intensity LED indicators and a maximum horizontal flight speed of 10m/s.